The "unprecedented" warm water in the Pacific caused a massive toxic algae bloom from California to Alaska. Scientists believe the mysterious deaths of more than two dozen whales in B.C. and Alaska since May are probably related to the so-called "Blob" of warm water in the Pacific Ocean. The Blob is a 1,600 kilometre wide patch of warmer-than-usual water that has been linked to several anomalies in the Pacific, including a massive toxic algae bloom that contaminates the krill and sardines that many whales eat. "[The whales] were attending a couple of major parties, and unfortunately, they got food poisoning," said Andrew Trites, a UBC professor studying the dead whales. "Each krill body was essentially a gel capsule full of poison. And if they ate enough of it, it's going to cause brain damage, and eventually seizures." "In the worst cases… it causes death." What's killing whales off B.C.-Alaska coast? The toxic algae is eaten by creatures like sardines and krill, which are in turn eaten by larger creatures like whales. The toxins build up in creatures higher up on the food chain, multiplying the poison's effects. 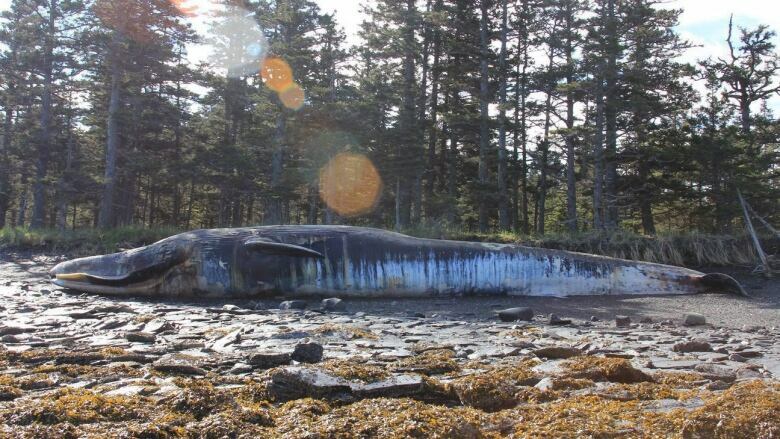 Trites and his colleagues looked at other possibilities: entanglements with fishing gear, ship strikes, and starvation; but because these whales all died within a few weeks, and mostly shared the same diet and other behaviours, Trites says toxic algae poisoning is the most likely cause. He said pinning down an exact cause of death was a challenge, as the corpses have washed up on the shore in various states of decomposition. But by process of elimination, the algae caused by the Blob is now considered the prime suspect. "When we look at the bodies that have washed ashore, the few that were recovered, they all looked to have been in pretty good condition. No signs of being hit by a ship, no signs of starvation, no fishing gear around them, and so right away we can start to rule these things out," he said. Although B.C. and Alaska have never seen anything like this before, Trites says a similar situation is unfolding in California, where creatures like sea lions, seals and seabirds — which also eat sardines — have also been dying since the algae bloom began. Trites says the exact cause of the whales' deaths will probably never be known with 100 per cent certainty because the corpses were decomposed and the toxin produced by the algae is water-soluble. He believes that the current algae bloom event is probably ending due to colder days ahead, but says the possibility of similar events happening in the future is certainly there. He says that next year, scientists hope to be quicker to action when it comes to testing algae blooms to see how toxic they are.